After two days of bird-watching and visiting Mayan ruins in the flat, dry savannah of Crooked Tree Wildlife Sanctuary, and two days of bird-watching and hiking in the mountainous jungle of Bocawina National Park, I have arrived in paradise on Tobacco Caye, a small island located fifteen miles east of mainland Belize in the Caribbean Sea. 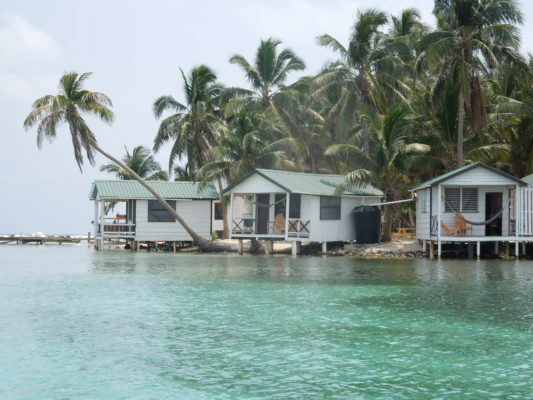 There are twelve hundred such cayes along this coast, the second longest barrier reef in the world. For three days I am staying in an adorable bungalow whose front porch is in the sand and whose back porch is in the sea. While sitting in an Adirondack chair out back, I am transfixed by the turquoise water and the wildlife passing by. There is a parade of large flat sting rays in various shades of gray, gracefully gliding along; dozens of frigate birds, identifiable by their forked tails, flying effortlessly on the warm air currents; and a brown pelican having spied an afternoon snack, diving into the water and coming up with its catch, hungrily gulping it down its wide gullet. I go snorkeling and see trumpet fish, clown fish and other beauties, one school of parrot fish camouflaged like the sea bottom by their grey and pink coloring. There is a four-foot nurse shark lazing under a huge brain coral, its unblinking beady eyes staring straight ahead. Fan corals, lavender and taupe, lacy and delicate, wave in the current as do the lanky branches of sea plants enveloping an abundance of silver fish edged in gold. Indeed, I have never before seen such sea life. The reef is an underwater forest: dense, alive, abundant, gorgeous, filled with variety, texture and color. After sunset, I try night snorkeling. Armed with a high-power under-water flashlight, I see menacing-looking barracuda hanging motionless in the water; a giant crab covered in barnacles, creeping along unevenly, one leg at a time; a spotted eel open-mouthed, displaying sharp, pointy teeth; a yellow ray slinking along the sea floor; a green spiny lobster; fat sea cucumbers; black sea urchins, and anemones whose many tentacles dance under the bright light. How vivid the sea looks! On another day, I go sea kayaking. 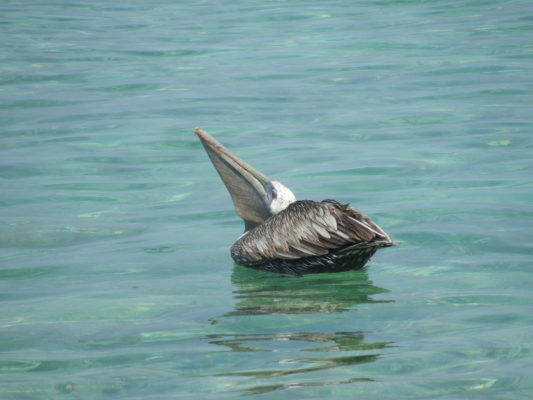 I paddle three miles to Man ‘O War Caye, a nesting place for hundreds of frigate birds, drawn to this small uninhabited island, safe from snakes who, elsewhere, would devour the birds’ eggs and their young. 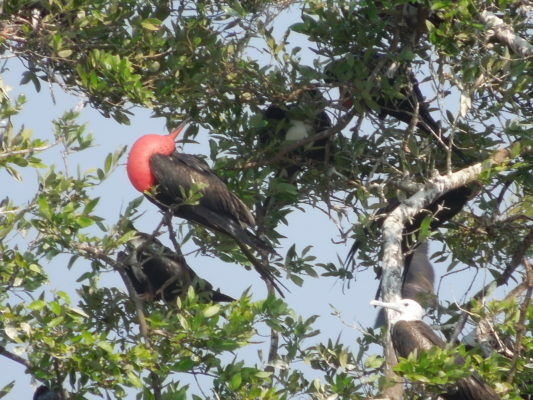 The males court the females by expanding their throats into what look like bright red balloons. Apparently females are attracted to the biggest, reddest balloons! Belize is a land of many cultures. Most recently, it was a British colony from which it became independent in 1981. However, it was settled thousands of years ago by Mayans, and beginning in 1797, by an African-Caribbean people called Garifuna. During my visit here, I have been introduced to some of their history and customs by knowledgeable and companionable guides. That’s on my list. When you have a moment please let me know what co. You went with! Happy Travels! It sounds heavenly! I may have to go to the other side of the world to experience it, too! When in the Galapagos we were told the expanding throats may also allow females to check out whether the males have any infestations. Wow Adele, it sounds wonderful. Another place to add to our bucket list! You’re living the life! PS- ITMFA!!! XOXO from Boston! Sounds like a wonderful adventure and how fortunate to see all the fascinating and beautiful underwater wildlife. I’ve shared it with my co-worker who scuba dives. Serenity – peaceful. Love the cabana’s. I love your vivid descriptions of the ocean life. I feel like I’m snorkeling with you. Belize is now on my bucket list! So glad to get the version with photos. Thank you Adele for sharing these adventures. I hope that your experience is delightful. Amazing trip, dear friend. I loved everything about it! Your adventures continue to enthrall me. Can’t wait to “experience” the next one.